Track Trailer has become one of Australia's most respected offroad caravan and camper trailer manufacturers. We get the inside scoop on what makes this company work. To thrive in Australia’s ever-growing RV industry, is it enough for a manufacturer to simply keep pace with demand or to skin the cat slightly differently to their many competitors? Like every industry, there are those out to make a quick dollar, short shrift given to high ideals and impassioned notions of product development. But, equally, there are those who truly walk the walk and have the track record to prove it. In a busy, if not overcrowded, marketplace it’s the manufacturers with a singular commitment to new technology, the ability to read the tea leaves and adapt to new trends accordingly, as well as a dogged focus on quality, that will succeed. Few other Australian RV manufacturers reflect this approach more than offroad RV builder Track Trailer. Nor, for that matter, is any name as synonymous with offroad touring. Like its RVs or not, there’s no denying Track’s reputation. The question is, how has Track Trailer maintained its place in the market, its reputation, when so many others have been and gone? The simple answer – hard work, dedication, customer focus – would be a disservice. 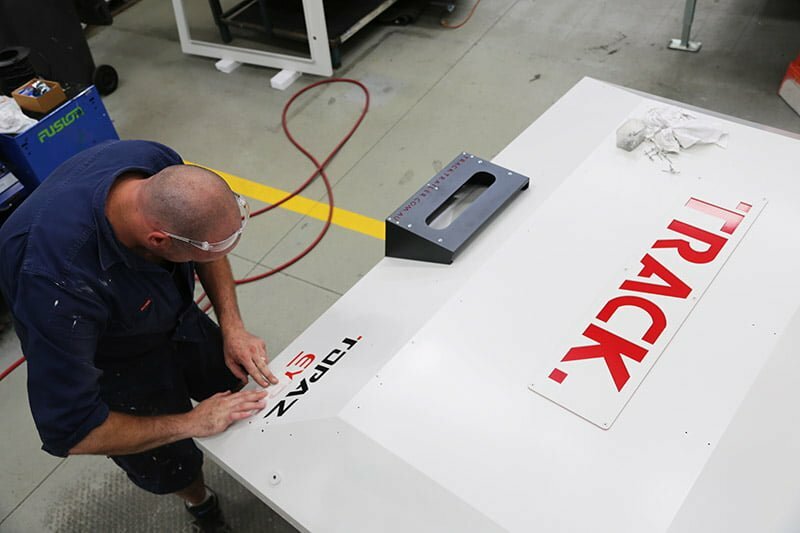 Go behind the scenes of the impressive 800-square-metre showroom known as Outback HQ, Track Trailer’s retail arm, and you’ll find a purposeful company with an equally serious intention to support local manufacturing and suppliers. Track Trailer was founded in the 1980s by a well-known figure in the RV industry, the late Alan Mawson. The company, however, really hit its stride with the development of the venerable Tvan at the turn of the millennium. By that stage, Track Trailer’s current owner and director, Gerard Waldron, had joined the fold, and Tvan was their joint labour of love. By the time Tvan was launched, Gerard had bought the business. Gerard Waldron, Track Trailer’s owner and managing director. To understand the importance of this time, it’s worth reflecting on how it came to pass. When the Gas and Fuel Corporation, where Gerard worked for 14 years in a senior role, was privatised, he decided to load up the family and head into the outback. The trouble was, he couldn’t find a camper that suited his needs. With his mechanical engineering background, Gerard had well-founded opinions on how a true bush-going camper should be built. The only rig that measured up was the Track Trailer Eagle, then known as the Type 3. He fondly recalls assembling the first three Tvans over his Christmas break in 2000, on leave from his day job, so as to meet the first orders. It was a “family and friends” operation comprised of Gerard, Alan, some mates, and his two sons, Des and Lloyd, both of whom now hold senior positions at Track Trailer. Those first vans, bolted together while others worried about Y2K and nursed New Year hang-overs, marked a turning point for Track Trailer and forever changed how Australians toured the outback and bush. With their composite aluminium panels, rear hatch access to the sleeping area, drop-down hard floor, and the now-famous MC2 Asymmetrical Link independent suspension, the Tvan was unlike anything the market had seen before. “We wanted to break the rules and find new and better ways of doing things, so philosophically that’s always been part of our journey,” Gerard said. MC2 Asymmetrical Link suspension was first developed for the Australian military. This journey also includes Track Trailer’s well-known work with the Australian Defence Force. Aside from designing and building the aforementioned MC2 Asymmetrical Link suspension originally for the Australian military, before applying it to Tvan, Track has developed chassis systems and, more recently, a special trailer for the ADF’s fleet of armed and armoured Hawkei protected mobility vehicles. Gerard and the team’s qualifications, combined with the challenges inherent to the ADF projects, has created a culture of engineering seriousness, of thinking outside the box, to find innovative solutions to common RV problems. For example, Track’s design department uses advanced software to create 3D models of its vans. This means, in a process known as finite element analysis, Track can apply in a virtual environment real-world stresses to every component. It tells them if a component will succeed or fail before it’s built. Since it was launched, Tvan (and subsequently all Track Trailers), have been fitted with properly engineered wiring looms for the 12V systems, manufactured to automotive standards. Many RV manufacturers will run the 12V cabling themselves, but as the electrical complexity in RVs has increased, Track Trailer saw sense in outsourcing this critical job to a specialist. The result: quality assurance, plug-and-play wiring looms, an ability to upscale production according to demand, and introduce more and more complex electrical technology into its vans. You could say Track Trailer feels the need to implement the most advanced manufacturing techniques as practicable on a cellular level. In fact, Gerard estimates that the company, as a percentage of its workforce, employs more qualified engineers than any other RV manufacturer in Australia. Unlike in the automotive industry, building a caravan or any other type of RV has never been a completely automated process. As recently as 2010, hand-built cabinetry, for example, was the norm. Track Trailer, however, has adopted technology that ensures each model is, to the millimetre, the same as the one before it. But technology is only part of the story. “We are also philosophically committed to Australian design, manufacturing, and partnerships with Australian suppliers,” Gerard said. “Our top three suppliers have been with us for more than a decade, some for 15 years, and during this time we have worked on innovation projects together. We can learn from their industry and their capabilities, and we teach them things as well. Believe it or not, these three suppliers, each one an Australian manufacturer, account for more than half of the costs for parts of a Tvan. A Tvan Firetail is water deluge-tested at Outback HQ before it’s shipped out. Gerard estimates Track Trailer has contributed more than $10 million in taxes and charitable donations in the last few years alone. A good corporate citizen, the company has also implemented a broad recycling program in which everything that can be recycled, is. Also, each new van is ‘deluge’ tested for leaks before being shipped off, with simulated rain pouring on each van for an extended period using rain water collected in large tanks behind the factory. Later this year, Track Trailer will install a large solar array to further offset its environmental impact. The manufacturing plant is clean and organised, with clearly skilled staff going about their business building the company’s range of vans. Aside from Tvan, there’s the Topaz, Track’s larger, caravan-like rig, and the Mate, an RV that resembles a conventional trailer with a rooftop tent attached. Track Trailer’s marketing manager, Gerard’s son Lloyd Waldron, pointed out a neatly stacked pile of Tvan chassis made of Australian BlueScope steel as an example of Track’s commitment to Australian suppliers. No doubt, anything built by Track Trailer is a high-end product, and the quality is reflected in the price. But does the company’s commitment to sourcing its materials from Australian suppliers, rather than purchasing cheap steel and other materials from overseas, play a part in the price? “We source our components from Australian businesses,” Lloyd said. “For example, we get all of our Dynaproofed canvas from Ballarat (Vic). Mulgrave (Vic) is where we get our sheet metal from. These companies need to employ Australians, so the product costs more. “What does this mean for our customers? Yes, they could choose from an array of other camper trailers in a cheaper price bracket and that might suit the goal of that customer. You don’t need hard-core offroad capabilities to visit Wilsons Prom and camp for a weekend. But if you feel like driving to Coober Pedy and turning left, that camper won’t necessarily be up to the job. And that’s Track Trailer’s market niche. Our vans are manufactured to deal with long term, repetitive corrugations, and are guaranteed to get there and back in one piece. This makes it difficult for competitors inclined to replicate a Track Trailer and sell their imitation for less. “Anyone who started from this point would have to go through all of the development to understand why we have built our vans the way we have, and I have no doubt that any copied products on the market won’t be the same weight or have the same level of specification, or be capable of doing what our vans can do. 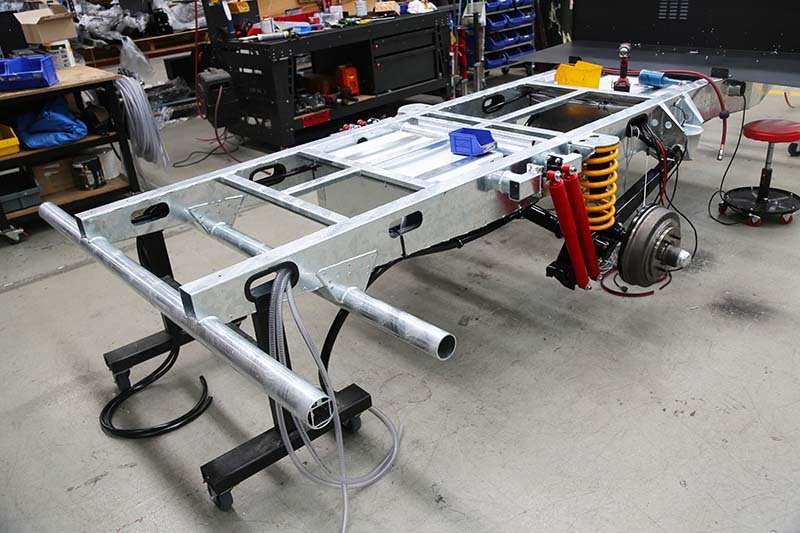 “We build our vans’ bodies here to match their chassis and suspension. Combine it all, along with our warranty, a dealership in every state and the ability to have your van serviced anywhere, and I think Track Trailer has the offroad touring market completely covered. Gerard Waldron was, for a number of years, at arms’ length from Track Trailer, though he remained as chairman while simultaneously working as the managing director of the Australian Road Research Board. Having since retired from the ARRB, he is now focussed completely on Track Trailer. But his return does not necessarily herald major changes to the direction or products of Track Trailer. Instead, he is looking at the bigger picture, developing strategies to ensure Track Trailer remains viable for decades to come. He also intends to make a larger contribution to the Australian RV industry. “The RV industry is a major contributor to the national economy, it employs a lot of people and gives a lot of people the opportunity to travel into places like the outback and contribute to the tourism industry,” he said. He would like to apply his expertise to the potential development of RV manufacturing codes and practices that emphasised performance-based constructions standards. What’s next for Track Trailer? While both Gerard and Lloyd are coy about the potential for new models, it’s clear that among the priorities, research, development, engineering new solutions to old problems, and improving their current products, are high on the list. It’s also clear the Waldron clan has invested plenty of emotional capital into Track Trailer. But this generation of good work and, yes, a bucketload of sweat, has not only set a high standard for offroad caravans and camper trailers, it’s given travellers the confidence to venture further into the Australian outback. And that alone makes it a job well done. Previous articleSupershow: Three of the Best!